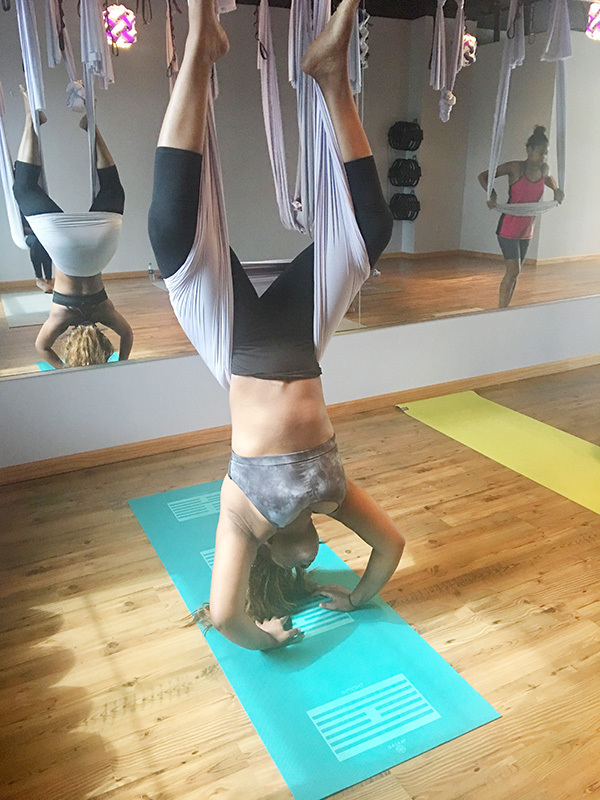 A few months ago, I discovered aerial yoga on Youtube and I was determined to try it. With my birthday coming up, I thought it would be the perfect opportunity. My friends and I signed up for a private class at Vita-Prana, a yoga studio right outside of Atlanta, GA, and we learned some fun and somewhat challenging poses. At first, we did some regular yoga poses on the mat and then we gradually worked our way into the hammock, one leg at a time. Once we were in the hammock, our instructor Vita began showing us different poses to try. What I didn't realize was that the hammock can easily dig into your skin, making some of the poses uncomfortable and somewhat painful. But Vita came to the rescue and showed us more comfortable options. When posing in the hammock, especially upside down, you must trust yourself and position your body in a way where you won't fall. I admit I was a little scared that I would fall out of my hammock, but once Vita showed us the correct way to hold ourselves up, it was a piece of cake. The experience was freeing and fun and now that I got the first class out of the way, I am willing to take on more challenging poses fearlessly.